For the 2019 program, we are happy to offer on-line registration and payment! The "Bobcats" is our program for elementary school-aged athletes. It's designed to teach runners the basics of track and field training – specifically the running and jumping events. Sprinting, middle distance running, relays and jumping are practiced with an emphasis on fun, skill development and personal improvement. Participants are divided into abilities/age groups and focus on exercises, drills, games and workouts that match their current abilities. All Bobcat athletes can choose to participate in the District H Legion meet in June. We hope that runners will leave the Bobcat program with an improved fitness level, good running mechanics, and the desire to continue in the sport. 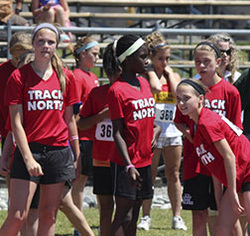 Great 7's and 8's are welcome to continue summer training with Track North and are welcome to become Track North members throughout their high school years and beyond. If you cannot make the Registration Day - please contact Jenna Thornber via email (see contact information at bottom of page). The program runs for eight weeks from Tuesday April 30 to Thursday June 20. Practices run rain or shine! Be prepared for all weather! A typical practice begins with a short warmup run, followed by an active warmup routine and drills to practice proper running form and mechanics. These drills are followed by instruction in one or two events. The final 10-15 minutes of each session is spent playing a running-related game, such as ultimate Frisbee, soccer, obstacle course relay. A short stretching session completes each session. Sessions last approximately 75 minutes. Note About Parking: Please use P13 to park for both Bobcat Registration and for drop off/pick up for each practice. This is the large lot by the Ben Avery Pool and is FREE after 4pm. The small lot behind the track only holds 14 vehicles and is usually full by the time Bobcat practice starts. Parking anywhere along the stadium road will garner you a parking ticket by university security. Thanks!